Tourism on the moon is envisaged in new Homer Hickam book, advocating preserving the Apollo 11 site. A new bill introduced into the U.S. Congress would establish the Apollo Lunar Landing Sites National Historical Park on the moon. However, the proposal is seen by some as lightning rod legislation, sparking controversy in legal and public circles. Called the Apollo Lunar Landing Legacy Act, the bill — House Resolution (H.R. 2617 — was introduced July 8 by Rep. Donna Edwards of (D-Md.) and was co-sponsored by Rep. Eddie Bernice Johnson (D-Texas). Edwards said her bill would expand and enhance the protection and preservation of the Apollo lunar artifacts while providing for greater recognition and public understanding of this achievement for generations to come. The Act, Edwards said, "will ensure that the scientific data and cultural significance of the Apollo artifacts remains unharmed by future lunar landings." The Act would endow the artifacts as a National Historic Park, thereby asserting unquestioned ownership rights over the Apollo lunar landing artifacts. "The legislation will additionally require the Secretary of the Interior to pursue nominating the historic Apollo 11 lunar landing site, where humanity left its first steps on the moon, as a World Heritage Site," the lawmaker said. Edwards said the Act builds on the recommendations of a 2011 report titled "NASA's Recommendations to Space-Faring Entities: How to Protect and Preserve the Historic and Scientific Value of U.S. Government Lunar Artifacts." But the proposal has received a thumbs-down response from the Citizens Against Government Waste (CAGW) organization, based in Washington, D.C. In a July 24 statement, the group gave Edwards and co-sponsor Johnson their "Porkers of the Month" honor "for straying so far from reality's orbit, wasting the taxpayers' money on the paper and ink on which H.R. 2617 is written, and engaging in sheer 'lunarcy.'" "I applaud the idea that two Congresswomen have decided to spark public dialogue about protecting the artifacts on the moon as an important part of American and ultimately, humanity's lunar legacy," said Beth O'Leary, an associate professor of anthropology at the University of New Mexico in Las Cruces. She is a leading expert in the field of space archaeology. "It will be interesting to see the responses to this effort by the federal agencies concerned," O'Leary told SPACE.com. In reality, humanity went to moon on an extraordinary day now over 44 years ago, O'Leary said. "We have an opportunity now to honor that event and are entrusted to do so for the generations who will come after us." Apollo 11's Tranquility Base landing site on the moon — a future tourist haven needing protection? "In my view, the Bill is a rather clumsy product of a seemingly uninformed 'drafter' or drafting committee," said George Robinson, a space law practitioner and retired Associate General Counsel for the Smithsonian Institution. "Referring to the proposed site as a 'national' park implies that only the United States and NASA should be recognized for the Apollo program and its successes and failures," Robinson told SPACE.com. "In fact, many countries offered and provided critical components of the program, from alternate emergency landing sites, to unique technology and personnel with equally as unique specialty capabilities, to tracking stations, and on and on," Robinson said. The proposed legislation seems "consistently inconsistent," Robinson said, and "reflects such an element of ignorance, superficiality, and casual disregard for current world opinion that it might well be tossed and a rewrite undertaken with some element of very relevant factual knowledge." That recasting of the bill, Robinson emphasized, should include the fact that the "NASA of old no longer is capable of assuming independently the next step in leading the way to permanent off-planet migration and physical salvation of the humankind species." "Perhaps, just perhaps, attention can be turned to the creation of a new and uniquely effective international, global, and perhaps even transglobal entity in which the United States could assume a very influential, if not lead role," Robinson added. The reaction in the non-U.S. legal community has been one of concern and decided negativity, said Michael Listner, the founder and principal of the firm Space Law and Policy Solutions, based in New Hampshire. "Preserving both the artifacts and the presence of mankind's historic activity on the moon is an important effort," Listner said, "but it will require a fresh legal strategy to obtain that goal preferably in the form of an international norm that allows a nation like the United States to exercise jurisdiction over landing sites, like Tranquility Base, for purposes of preservation without actually asserting sovereignty." Listner said that the approach taken by the bill is "fundamentally flawed" because it attempts to harmonize existing federal preservation law via the National Park system with "international law," which includes international space law. "The means of creating national parks under 16 U.S.C. 1 [Title 16 of the United States Code, which outlines the role of conservation in the code] requires sovereign control over the real property," Listner said. "Since the Outer Space Treaty prohibits sovereign claims over the moon, any attempt to create a National Park under 16 U.S.C. 1 will fail." Staying afoul of footprints on the moon is a concern of those advocating protection of the Apollo 11 landing spot. The proposed idea of protecting lunar landing sites with national parks on the moonhas caught the ear of Homer Hickam, former NASA engineer and best-selling author of the memoir "Rocket Boys," later adapted into the popular film "October Sky." 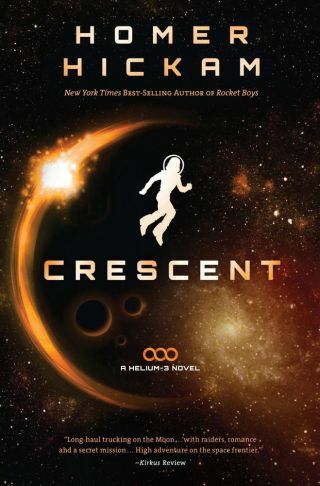 Hickham has foreseen that future moon residents would visit historic landing sites in his just released novel "Crescent," the second volume in a series called "Helium-3" (Thomas Nelson, May 28, 2013). "To me, I'd claim those parts of the moon. We've certainly invested enough blood and treasure to do that," Hickam told SPACE.com. "To hell with any past agreements we've had … they are passé. That's sacred American soil as far as I'm concerned," he said, and advocates ringing the Apollo sites off and saying "all these worlds are yours, except these. Stay away from them." Hickam said he's aware of plans by private commercial firms to send small rovers to the moon, able to trundle to Apollo landing sites. "I'd like that, but I do think they have to be careful and not run over, say the Apollo 11 footprints, specifically. That would be like running over Columbus' footprint on the beach when he landed in the New World," Hickam said. "All of these things have to be protected." Tourism will be a major industry on the moon, Hickam said. "So there will be another reason to preserve those sites," he said.